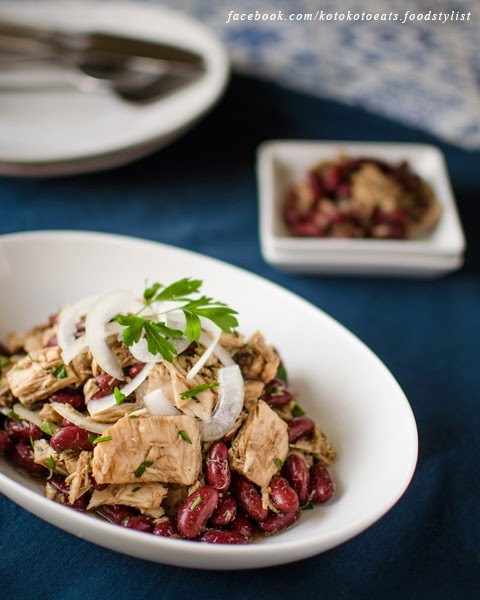 Aaaah, the tuna and kidney beans salad that my Italian friend used to make... I missed it, so I decided to make it myself. All you have to do is mix the ingredients! 1) Slice the onion and let it sit in cold water for about 10 minutes. Rinse, and squeeze the water out. Chop some Italian parsley. 2) Place tuna in a bowl with the oil from the can. 3) Add the onion, balsamic vinegar, vinegar of your choice, Italian parsley, and mix. Add salt and pepper to taste. If you let it sit for about 10-15minutes, the salad gets more flavorful.